We would like to thank Todd Medema for the review copy of Expedition: The Roleplaying Card Game used for this preview. Other than receiving the preview copy we at Geeky Hobbies received no other compensation. Receiving the preview copy had no impact on the content of this preview. In Expedition The Role Playing Card Game, you and a group of your friends take an adventure through a unique world where you complete quests and defeat creatures that get in your way. 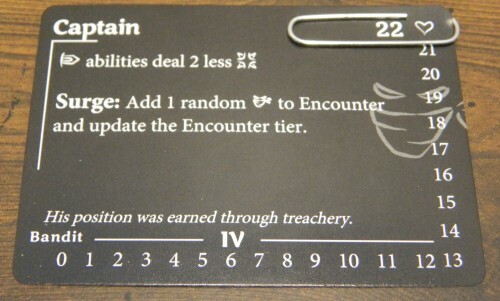 To begin the game each player chooses an adventurer card. Each adventurer has different special abilities and draws a number of ability cards that match the abilities listed on the character’s card. Players look through all of their ability cards to familiarize themselves with them. Each player then shuffles their ability cards and places them face down. Each player also sets their health to the maximum amount by placing a paper clip over the top value. Here are two of the characters you can play in Expedition. The Hungry Halfling starts with four music abilities and four melee abilities. The Pack Rat starts with three ranged, three melee, and two magic abilities. Based on the mode selected, players will either follow the story presented by the app or told by the guide/dungeon master. Players will face decisions and have to decide as a group on how they would like to proceed. Here is an example from the featured quest. Players read the text and decide whether they would like to help the visitors. Eventually your group of adventurers will encounter a combat situation. The app or guide will tell the players which monster cards are drawn. Health trackers are put on each enemy card at their maximum health. The captain enemy reduces melee damage by two. When a surge occurs another bandit is added to the encounter. 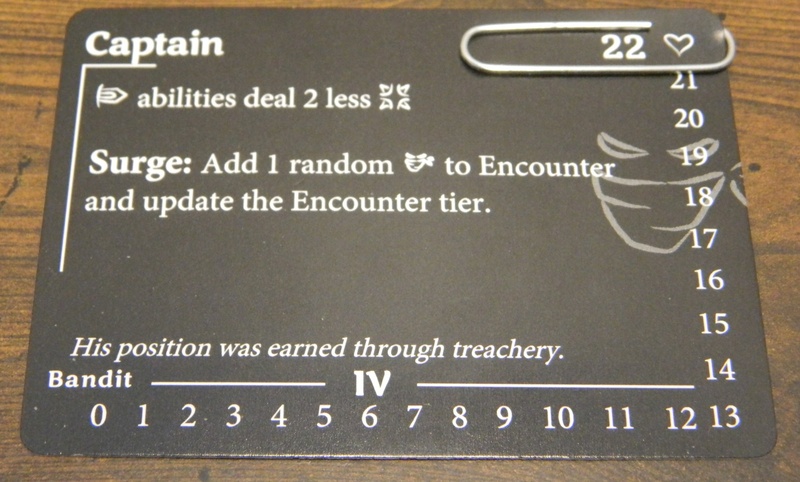 Before each round of combat, each player shuffles their ability cards and draws the top three cards without looking at them. When everyone is ready the apps timer is started and everyone looks through their cards to determine which one they want to play. Some cards allow players to play an additional card. These are the three abilities drawn by one of the players. The player needs to choose one of the abilities to use this round and then touch the device to indicate they made their choice. When a player has played their card they put their finger on the mobile device to indicate they have played their card. When all of the players have played their card and placed their finger on the device the timer is stopped. Players need to make their decisions as quickly as possible since the longer they take the more damage the enemies will deal to the players. To resolve the players cards they have to roll a d20 dice. If they roll a higher number than the number printed on the card, the ability is successful and the player deals the damage and/or other effects of the ability. Each player resolves their abilities and the damage done to the enemies is reflected on the enemy cards. In order for the healing frost to be successful, the player had to roll eight or higher. They rolled a 16 so all of their party members heal two health points. If a player rolls a number smaller than the number printed on the card, the ability does not work. The player has rolled a three and had to roll an eight or higher in order to be successful. Nothing happens with this player’s ability. 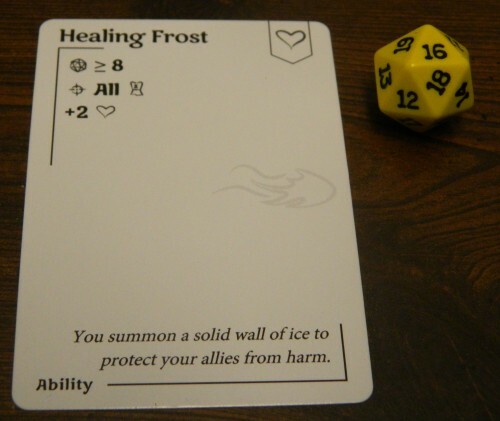 If a player rolls a twenty some of the abilities offer additional benefits. 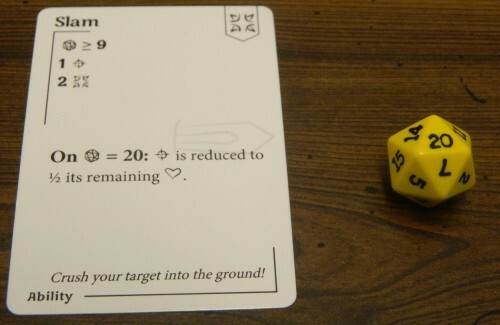 Since the player rolled a 20, the target enemy loses half of its remaining health. If a player rolls a one, the ability backfires and hurts the player(s) and helps the enemies. 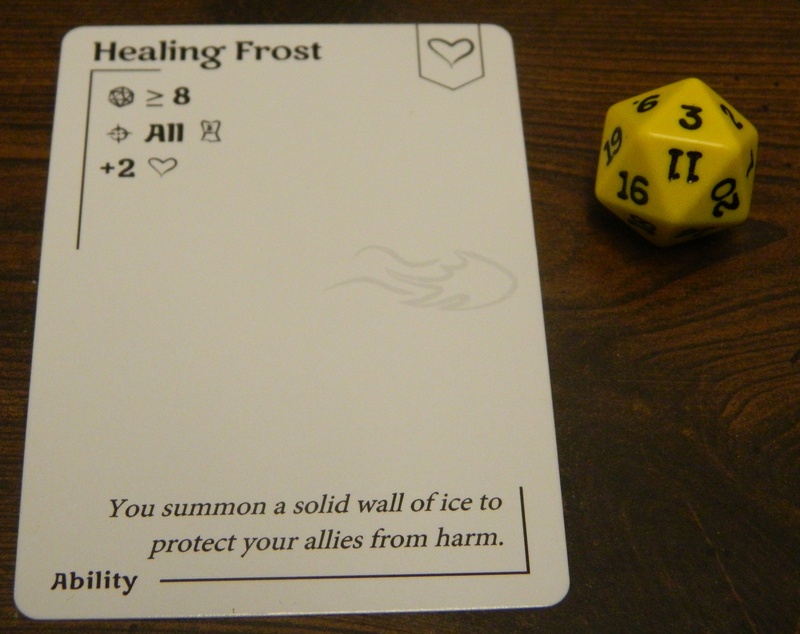 The player rolled a one so the healing frost ability backfires. All of the enemies will be healed two health points. If all of the enemies aren’t defeated, the enemies deal damage to the players based on the strength of the remaining enemies and how much time the players took to play their cards. Occasionally the app will say that a surge has occurred which means the enemies’ surge abilities are activated. The combat ends when either all of the adventurers or enemies are dead. If the enemies are all killed the adventurers are victorious and they continue on their adventure. For being victorious the players either draw additional ability cards or loot cards which can be used in future combat situations. If they are all defeated/killed, the game ends. Expedition The Role Playing Card Game has three different ways to play the game. The featured quests includes adventures you can go on with your friends that don’t require having a guide since the app handles all of the storytelling. The guided adventure mode gives the guide a step by step process to create an adventure for their group. Finally the custom encounter mode has the guide create their own story and the app just handles the combat elements of the adventure. Being a self professed geek/nerd, I have to admit that I have never actually played a tabletop role playing game before. I have always wanted to play tabletop role playing games before but there are a couple things that have kept me away from trying them. I have never really had enough people to play a tabletop RPG. It is really hard to play RPGs with two people (the most I would be able to find to play an RPG) since one person usually has to be the guide/dungeon master. When you first look at tabletop RPGs they can be pretty intimidating since most of the games have a lot of rules. Once you get a hang of the rules I doubt they are that hard but the amount of rules in most RPGs have kept me from trying an RPG in the past. I never felt like I would be creative enough to actually be a guide/dungeon master and wouldn’t find someone that would want to be the guide. Since most RPGs require a guide, this turned me off from trying the genre. When we at Geeky Hobbies were contacted by the creators of Expedition The Roleplaying Card Game I was excited to try out the game. The game looked like it would address all of the issues that I have had with playing tabletop RPGs in the past. The game has guided quests so you can play the game with two people since you don’t need a guide/dungeon master. The game seemed simpler than most RPGs since it revolves around using cards and the app itself handles a lot of the combat. The guided quests also eliminate the need to be creative enough to create your own adventures. While still in the development stage, Expedition The Roleplaying Card Game has the potential to be a fantastic tabletop RPG game for people who are scared off by traditional RPGs. If it wasn’t clear you do need an Android or Apple tablet/phone in order to play Expedition The Roleplaying Card Game. Apps for some board games are kind of gimmicks but it is not the case with Expedition. The app actually adds a lot to the game which probably couldn’t have been done without the app. The app is used mostly for combat. The combat system in the game is really interesting and actually does a good job simulating combat. Combat is timed so you can’t just sit back and debate which ability will be best. If you do you will die quickly since the enemies will deal a bunch of damage. You need to quickly look through your cards and make a decision within around ten seconds or you will incur a lot of damage. This takes a while to adjust to especially as you are learning what each ability does. As you get more familiar with the abilities though you can make decisions pretty quickly. This speed element is really interesting, makes combat move quickly, and is fun. If you don’t like your decisions rushed though, Expedition may not be the game for you. One of the goals of Expedition is to make RPGs more accessible and combat is one area where this is really shown. There is no need to reference books and charts to figure out what specific abilities do. Each card has everything you need to know about the ability. It tells what the ability does, how much damage it does, how many people it can target, and even special abilities when successful and unsuccessful. For combat all you have to do is roll a die and see if you roll higher than the number on the card. If so you are successful. If not your ability fails. Then you just follow what is written on the cards. The game uses a lot of symbols which take a while to get the hang of but helps a lot once you know what each one represents. The only thing I don’t love about the combat is that at times the game doesn’t give you a lot of time to make decisions before you take a lot of damage. Sometimes you have to play a card that might not be the best choice just to prevent getting hit for more damage. I would suggest adding a difficulty slider/levels to the game which when made easier would give players more time to make decisions before incurring a lot of damage. If players want a real challenge they could also increase the difficulty which makes them have to decide even quicker. While the game is easy to play, it doesn’t mean that the game is easy to win. In the first featured quest it actually took my group of two, two times to beat the mission. We actually almost lost to the first enemy, a giant rat. I attribute the difficulty to a couple factors. First I think the game will be easier with more players since a lot of the abilities support other members of your party and with only two players these weren’t that helpful. It also didn’t help that we didn’t roll well which means that a lot of our abilities failed. I would have made Wil Wheaton proud with how my character failed repeatedly. I think the first mission does give you a little too difficult of enemies to face as well. I think the game should have given you some easier enemies to face. At least based on the one featured quest currently in the app, the featured quests are going to be on the shorter side which allows players to play the game even if they don’t have a lot of time. The first quest is probably around 20-30 minutes long depending on how well you do. Unfortunately the game only has one featured quest at this time. If this mission is representative of the other missions that will be included in the app I think you can have a lot of fun with the app without ever having to make your own adventures. The mission and the game as a whole seems to be taking a light heartened tone towards role playing games. 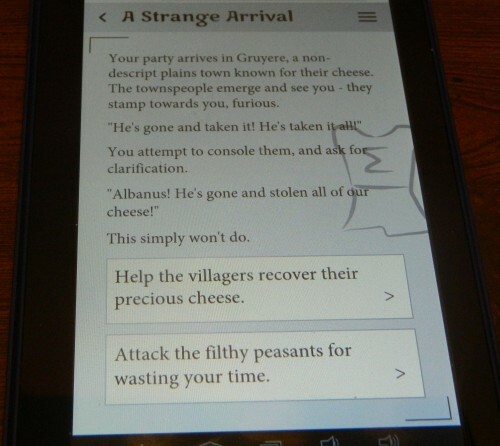 The first quest is a quest to find a village’s stolen cheese. It was surprisingly funny. The creators are planning on adding functionality to the app where players can create their own adventures and share them with other people as well. This means the game has the potential to have a bunch of fun quests to explore. Another thing I like about the featured quest is that it does such a good job of explaining how to play the game. The quest essentially works as the instructions for the game. Instead of just reading a bunch of text at the beginning of the quest, it introduces new topics to the players when they encounter them. For example when you enter your first combat the game explains the combat to you. After playing the featured quest the game nudges you towards creating your own quests. I give the game a lot of credit here as well since the game does a really good job taking you slowly through the process of coming up with your own quests. The game essentially has a step by step tutorial that helps you with every step of setting up a simple quest. If you were afraid to be a quest guide/dungeon master before, the app might help you finally try being a guide. Overall the components are pretty good for a non final version of the game. The app works well and actually adds to the experience. The cards don’t have a lot of artwork on them but they are well designed making it easy to find the necessary information on any card. This is actually pretty critical during combat since you need to rush to make a decision which means you have to skim the cards in order to not waste too much time. Expedition does have a couple things that I hope get addressed in the future. While the game does a great job explaining how to play, some of the cards/instructions could be a little more clear for players that have no experience whatsoever with RPGs. While the game actually plays pretty well with two players, the game seems gauged towards having more players. Quite a few of the abilities benefit from having more players playing the game and the game seems harder than you would think with only two players. For most people this isn’t much of an issue since most players play RPGs with a lot of players to begin with. At this point the app only has one featured quest so you have to create your own adventures after you finish that quest. I think the surges are a good idea but I think some of them are a little too powerful. Sometimes the surges occur so often that you will face another surge before you have dealt with what happened from the previous surge. 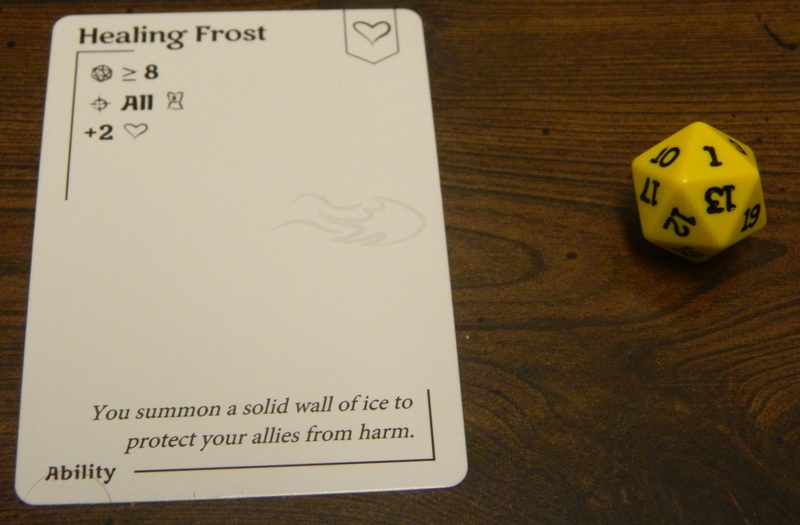 While it is still in development Expedition The Roleplaying Card Game shows so much potential for an accessible tabletop RPG. The game is easy to play and addresses many issues that might scare people away from trying a tabletop RPG. The rules are simple and are quick to learn so you aren’t stuck forever in the rulebook. The game is playable with any number of players and you don’t need a guide so you don’t need a player that feels creative enough to create an adventure for the group. The mission included with the app is funny and shows that the featured campaign could be good if it is further developed. The creators also plan on adding a way for people to submit their own quests for other people to play. This could add a bunch of quality quests to the game. If you already play a lot of tabletop RPGs and aren’t really interested in a lighter RPG or don’t like the idea of the speed based combat, Expedition might not be for you. If you are looking to find a way to get more of your friends/family into RPGs though it could be used as a great gateway into RPGs. If you have always wanted to try a tabletop RPG but have always felt overwhelmed to try one, I think Expedition The Roleplaying Card Game might be the perfect game for you. Expedition: The Roleplaying Card Game’s Kickstarter launches on April 8th, 2016. The app for Expedition is free but in order to play the game you will need to pledge $20 or more in order to get a set of cads and other components you need to play the game. To find out more about the game you can check out Expedition: The Roleplaying Card Game’s official website. The Kickstarter page for Expedition: The Roleplaying Card Game can be found here. Eliminates a lot of the concerns that drive people away from tabletop RPGs. The app is really well done and adds an interesting speed element to the RPG genre. Has the potential to be a great introductory tabletop RPG. Doesn't have a lot of featured quests at this time.